Now I've heard good things about this steak house, Outback Steakhouse located just opposite Lowyat Plaza in Bukit Bintang but haven't had the chance to dine there. Not until last weekend, where I had an opportunity to try out a couple of their signature dishes. Spanning 23 countries in America, Europe, Asia, Australia and the Middle East, Outback is an international name which expatriates living around the vicinity often come to frequent this outlet. The interior of Outback Steak House with an Australian theme. Inspired by the hit movie Crocodile Dundee, Outback Steakhouse was conceptualized as an American outlet with an Australian theme. With a rather unique tag line "No Rules" and everything is served "Just Right", the ambiance of the restaurant was perfect for a romantic western dining, which can also accommodate family and corporate dining. When I was there that evening, I noticed the crowd was a mix, locals, families with majority being foreign expatriates. We kicked off dinner that evening with a generous plate of Crispy Chicken Salad. Consisting of these rather huge pieces of fried chicken fingers served over mixed lettuce, with tomatoes, cheese, beef bacon, diced egg, croutons and homemade dressing, I felt it was okay. Would prefer if the beef bacon was crispier though, but I love the croutons as it came in this large crispy bits. Honey mustard, I think I found my new favourite sauce. Throw that in between the grilled flour tortilla with chicken, mushrooms, beef bacon, and lots of melted cheese, and you got yourself a really yummy appetizer. Did I mention I loved the honey mustard sauce, it went well with the cheese. Alice Springs Chicken Quesadilla was a mouthful to pronounce though. I'm not a big fan of pastas though, with the exception of Aglio-Olios, probably because of the sauce. Outback's Seafood pasta had these flat noodles lookalike served with shrimp, calamari and fish fillet. Tossed with their homemade marinara sauce and Parmesan cheese, this dish was not unlike the usual pasta offerings. I love my burgers huge, chunky, juicy with lots of sauce. Here we were treated to Outback's Bloomin' Steak Sandwich consisting of tender strips of sirloin, sauteed with balsamic glazed onions, melted cheese, and tomato. Served with a bed of rice, this wasn't bad at all. I prefered what came next though. Save the best for last, and my lovely steak came right at the end. Uniquely named Toowoomba Topped Fillet, it had sauteed shrimp and button mushrooms tossed in a tomato cream sauce and served over a seasoned and seared filet. The first piece came medium cooked which was a tad too dry, but we tried the second piece which was a perfectly seared medium-rare piece. Desserts have been the part where I loved most about a meal, and here Outback did not disappoint when we were served with their Chocolate Thunder from Down Under. Chocolate what? Well, I was intrigued by the name as well. Fresh-baked pecan brownie is crowned with rich vanilla ice cream, drizzled with classic warm chocolate sauce and finished with chocolate shavings and whipped cream, you can never go wrong with ordering this dessert. Overall it was a really good meal, at least for me. My first time over at Outback Steakhouse in Bukit Bintang even though it has been there for like ages. 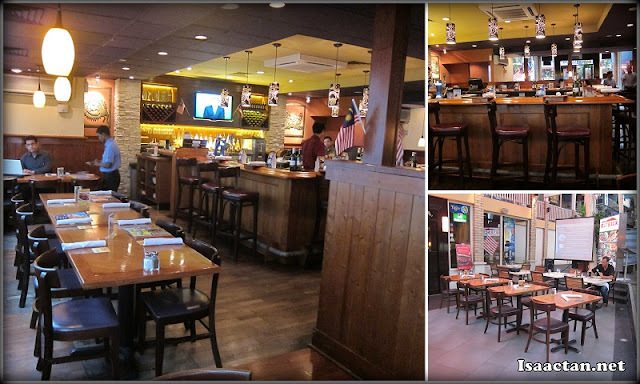 The ambiance complement the food really well, so do drop by Outback Steakhouse should you be on the lookout for some nice western fare in Bukit Bintang, Lowyat Plaza to be exact. I love all of them except the steak as I don't take it..
Looks like a another great spot for western food (; YUMMMM! the mushrooms are so cute. and the fillet! Havent seen such a big fillet in a while .